I had wanted to see this movie in theaters, but for whatever reason I missed out. And then after renting it, I managed to watch the movie about 3 times before shipping it back. Why? I was mimicking the plot, of course! No, really I was watching with one of the special features on… which wasn’t as special as I had hoped. But I’ll talk about that later. The movie is about a soldier who is enlisted in a special program to relive the last 8 minutes of someone’s life in order to solve a mystery of a terrorist attack on a train. The film stars Jake Gyllenhaal and the lovely Michelle Monaghan. They both play very nicely together, but I mainly concentrated on Michelle. Vera Farmiga and Jeffrey Wright also star as the people in charge of the special Source Code program. Describing what the Source Code is, is like explaining what the Matrix is. Well, not really, but really. 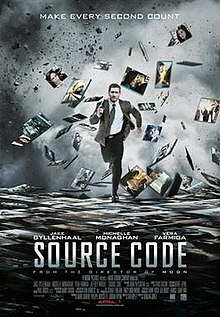 In fact, I’d call Source Code the combination of The Matrix and Groundhog Day. And I mean that as a compliment. I enjoyed this movie. And come to think of it, I enjoyed it’s director, Duncan Jones. Unknowingly and coincidentally, the day before I watched this movie, I watched Moon, which is what I believe to be a hidden gem of a film that few people I know, know about. In any event, this is a director to keep an eye on. I like his style and can’t wait to see what he does next after seeing how he handled these films. The other fun thing about this movie is how it deals with the topic of time travel and many worlds theory. Actually, this gets better in one of the special features that explains these things and more in fun animated explanations. Another special feature, that I hinted to earlier, was a trivia track that played during the movie. Instead of fun and interesting trivia, it just talked about TV shows and movies that fit in the same genre as Source Code and fun facts about Chicago, where the film took place. It’s not that it wasn’t interesting, it’s just that they weren’t as interesting as I thought they’d be. I don’t know. But overall, the film as itself is one that should be enjoyed. I obviously didn’t have a problem watching it more than once which means it makes my list of DVDs I’d one day like to own.